Save up to 80% on pre-owned Viasys Avea ventilators. The AVEA ventilator automates many of the routine tasks you face every day, allowing you to focus on what’s most important— your patient. 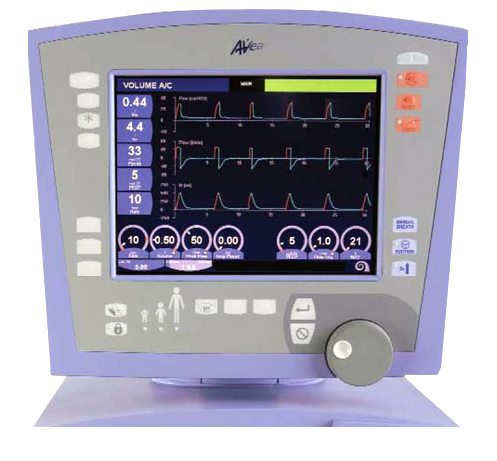 The exclusive BiCoreTM technology integrated into the AVEA ventilator connects you to your patient like no other ventilator can. Work of breathing—guiding ventilator weaning with work of breathing has been shown to reduce ventilator days. Transpulmonary pressure—studies suggest that the use of transpulmonary pressure guidance in mechanical ventilation may allow you to optimize PEEP titration. What’s most important is that this can be done in real time, with no complex maneuvers and no disruption in ventilation.